A few days ago I wrote a post over viewing various dividend paying stocks in the wine and spirits sector and figured a post highlighting some beer companies might make sense at this time too. 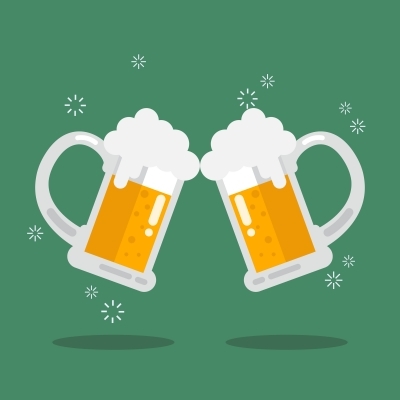 Beer, along with wine and spirits, provides a very stable and recession resistant business model that may afford a space in a dividend growth portfolio. While there are literally hundreds and hundreds of beer companies around the world, very few actually pay dividends while at the same time the entire market is essentially dominated by just a handful of mega players. Let’s begin by taking a look at one of the largest beer companies in the world, Anheuser-Busch InBev SA/NV (BUD). A company that really needs no introduction, BUD is a reincarnation of its former self after the Belgian brewer InBev bought Anheuser-Busch for $52 billion in 2008 creating the world’s largest brewer. With such iconic names in its stable of brands including Budweiser, Corona, Stella Artois, Beck’s, Hoegaarden, Bud Light, Skol, Brahma, Modelo Especial and many more, BUD clearly has tremendous brand power under its helm. Currently yielding 2.76% based on its biannual dividend, BUD has a moderately high payout ratio of 78.5% which is well covered by its current EPS of 5.53. Looking at the valuation of BUD it has a current PE of 22.4 which is slightly higher than its five year average and the market in general. Forward PE still makes this stock look a little expensive too at 21.6. Next is another famous beer maker Molson Coors Brewing Company (TAP). TAP was created after a merger between Canadian brewer Molson merged with Coors in 2005 creating the world’s seventh largest brewer by volume. As with BUD, TAP controls a very large cache of well known worldwide brands including Coors (Light), Molson Canadian, Keystone, and brews or distributes under the Amstel Light, Heineken, Murphy’s, Newcastle Brown Ale, Dos Equis, Sol, Tecate and Miller Genuine Draft brands along with Mickey’s, Milwaukee’s Best, Olde English 800, Sharp’s non-alcoholic, Foster’s and many more. Talk about brand power. It seems that between BUD and TAP you can control a huge portion of the worldwide beer market. Currently yielding 2.13% with a moderate payout ratio of 59.4% based on an EPS of 2.76 TAP’s dividend can be considered safe with room for future growth. TAP also has a pretty impressive ten year annualized dividend growth rate of 13.70%. With a current PE of 27.9, TAP can be considered quite expensive at current prices especially when compared to its five year average PE of 15.2. It seems that all alcohol related stocks are trading at rich valuations. Are people simply willing to pay up for these quality names? Forward PE looks a lot more enticing at 18.7. Finally, we’ll take a look at Brazilian beer and beverage maker Ambev S.A. (ABEV). Through its subsidiaries ABEV produces, distributes and sells beer and soft drinks primarily under Skol, Brahma and Antarctica brands. It also distributes popular beer brands such as Corona, Stella Artois, Budweiser and Bud Light among many others. Currently yielding a decent 2.84% with a moderate payout ratio of 67.8% based on an EPS of 0.76 (Brazil Reals) the dividend does appear to be safe. Looking at the current valuation of ABEV we have a PE of 24.8 which is above the five year average of 20.4. Forward PE is in line with current PE. Of course there are other large publicly traded beer companies that exist but unfortunately offer a low current yield. Names such as SABMiller plc (SBMRY) yields 1.83%, HEINEKEN (HEIA.AS) yields 1.50% and Boston Beer Co. Inc. (SAM) which yields 0.0% come to mind. That doesn’t mean that these companies might be bad investments it’s just that I prefer to focus exclusively on dividend paying stocks for my portfolio with a minimal yield. Have you considered any of these beer companies for your portfolio? Please let me know below. Yes, brewers and any other alcohol-related company are excellent long-term investments. I only hold Diageo at the moment (does a little brewing itself, though, of course, it is mostly in the spirits business). I am a bit confused with you last sentence about SABMiller and Heineken. You seem to suggest that they are not dividend paying stocks. You say that: “there are many other large publicly traded beer companies that exist but unfortunately few offer a current dividend” and then list these two. In the case of SABMiller, it yields about 1.9%. For Heineken the yield is about 1.4% (and set to grow quite a bit). Did I misunderstand your objection to these two companies? Were you just noting that they yielded less than the companies you mentioned? Anyway, thanks for the post. Very interesting quick breakdown of this very solid sector! Yes, it’s true that SABMiller has a dividend distribution along with Heineken. I just made mention of their current yield in the article. Thanks for bringing those two to mind. The yield for both are quite low compared to the other brewers. Like you, I only own DEO and plan to keep that stock long term. While it’s true DEO has a beer component the vast majority of their sales are focused on spirits. As always, I thank you for stopping by and commenting. Yes, they are certainly not high yielders. But they are solid growers! If SABMiller drops a bit more I may consider adding them to my portfolio. But Diageo looks the most attractive currently in the broader alcohol sector. Yes, Diageo has a very small non-spirit collection (only really Guinness and Jeremiah Weed from what I remember, though I am sure there are more). If Guinness wasn’t a “historic” brand for them I wonder whether they would have kept it. Though being the biggest stout in the world is certainly worth keeping I suppose. It is one of my favourite tipples for certain! Keep up the good work and thanks for taking the time to reply. Dividend Drive recently posted…BUY: WPP–An Advertisement in Growth and Income? I always appreciate the comments, corrections and questions left by fellow investors. It’s one of the reasons I enjoy writing for this blog as well as read others and share and exchange different investing ideas. DEO also owns the popular Red Stripe beer too among other lesser known brands but clearly they are a spirits company foremost. You can get some exposure to SABMiller through Altria (MO) and get a dividend! I spent some time looking at BUD about a year ago and didn’t really like how they tended to have more shares each year. This is in addition to them having a larger than desired payout ratio. Very true that SABMiller can be a conduit to dividend yield through owning MO as Altria owns just under 30% of SABMiller. Beer and tobacco… it doesn’t get more defensive than that. I used to own BUD a long time ago before it was bought out by InBev. It had been one of my best performers in my long term dividend portfolio at the time. As always, I appreciate your comment. Theres some huge brands here but honestly from an investment standpoint im more intrigued by the spirit companies rather than the beer. I think theres more room for growth there and the valuations dont seem quite as high. Thanks for the look at the brewers. Point taken. It seems that from an investment point of view people prefer the wine and spirits categories more so than beer. Though BUD had been a great long term holding of mine prior to being bought out by InBev. I’ll continue to hold DEO and take a look at BF-B and STZ going forward though I think DEO might be best of breed in the sector. Thank you for stopping by and commenting. Nice follow up on your spirits post. I have to agree with JC, I would be more interested in the spirit companies too, beer consumption has been dropping in most countries for years (primarily in Europe, not sure about Asia/South America), where wine and spirits seems to gain market share. While beer consumption might be going down in some countries you can still get international growth with ABEV and their beer and soft drink market. Along with beer they also distribute Gatorade, Lipton Iced Tea, Fusion, Monster, Red Rock, Pepsi-Cola and Seven Up among other non-alcoholic beverages. Thank you for sharing your thoughts. As others have mentioned, I like my stake in DEO more than any in the beer sector. More and more craft beer breweries are opening and thriving in the US. So much that the big companies have tried, unsuccessfully to bar or limit their sale, no pun intended. I think the wine and spirits are more stable for the long term. Not to say these big name beers are going anywhere, I just do not feel they are a good investment for me. Good post, thanks for sharing. HMB recently posted…Mobile Phone Plans, What are They worth? I certainly seems that DEO is the one go to stock in the alcoholic beverage space. I think many forgot that BUD was a long time dividend raiser before it was bought out by InBev and these days it seems that the pure play beer companies aren’t as robust as the wine a spirit focused companies. Like you, I’ll continue to hold onto my DEO and be content with my ownership in the sector. As always I thank you for commenting. Good list. I initially looked at BUD, but the withholding hassles with foreign companies stopped me from researching further. I do have my eyes on DEO (okay mostly spirits, but they do have Guinness). BUD was a great long term dividend payer while it was a U.S. company. I did enjoy having it in my portfolio and was sad to see it gone after InBev bought them out. I can understand your hesitation with wanting to own a foreign stock because of tax concerns but, at least as you mentioned, you get some beer exposure with DEO. They also own Red Stripe and Harp among others. Thank you for stopping by and commenting. Thanks for writing on one of my favorite topics! I also like how ABEV and BUD both make Skol, which I drank during my honeymoon in St. Kitts. I do believe that most of the stocks are overvalued in the sector and it is one I am wary of investing in right now. I used to be long BREW (and HOOK before it became BREW) and sold with a strong gain, but that was before my DGI days. Of the stocks you list TAP and SBMRY are the main ones on my watch list, but they sit behind a lot of better opportunities at the moment. In terms of the industry it is safe, people always want it. Yet the industry is undergoing strong changes right now towards micro-brewing, and I think we will see the same move in wine and spirits. No matter what happens it should be interesting, and I love all the new flavors constantly appearing on shelves in stores. There’s no questioning the resiliency of this sector and even with the onslaught of the microbreweries popping up, the mega-brewers seem to be buying up some of the smaller players or creating their own homegrown “craft” style beer. It’s true that even though this sector is very stable it doesn’t present the best of buys currently. But I always say that sometimes you have to pay a premium for rock solid companies. Thank you for stopping by and sharing your former holdings in the sector. Not surprised to see a Canadian one here! 😉 Still lots of beer drank over here! haha (although I prefer consuming wine). I think the yield is interesting for these companies. As you mentioned, valuations seem quite high for most of these companies, which would make me hesitate on the sector in itself. A good read anyway! As mentioned in other comments, the sector does not present the best of buys these days but then again it never really goes on sale either. Clearly the sentiment from various bloggers seems to gravitate towards the wine and spirits sector more so than beer. With that being said, DEO seems to be the clear favorite and you do get some beer exposure too with that stock. Thank you for stopping by and commenting. Great post and thanks for breaking it down for us. Not sure if I’ll be buying any of them, as valuations appear to be quite high currently, but do own Diageo in the spirits area. Ambev looks almost enticing to me, but those P/E ratios just are high, you know? Nice post though overall! Happy to read that you enjoyed the post. It’s clear from all the comments that most are interested in the wine and spirits sector more so than beer and that the lead stock in that category is DEO. Sure valuations are high in the entire sector but at least you are getting some pretty good long term dividend growth which is really what we’re after even if valuations may seem a bit high. As always I appreciate your comment. *thumbs up* for the beer investment. I have recently bought some shares in the local European brewery. Just think about your dividends paying for your beer. Though you may not have a stellar investment in your local European brewery you can at least earn enough in dividends to buy you beer for the rest of your life. What a perfect cycle. Buy their beer, give the brewery income, own the stock, the brewery pays you back in dividends, use the money to buy more beer. Awesome! That’s a great way to enjoy your investment. Thank you for stopping by and commenting. I described the great beer/dividend cycle. Buy beer, give the brewery income, own the stock, the brewery pays you back in dividends, use the money to buy more beer. That’s a great way to enjoy your investment. To answer your question… buy more shares which will give you more “free” beer for life. This certainly makes dividend investing fun. Ha! Thank you for commenting. Interesting. I haven’t really considered brewers before until I read your posting. I will keep my eyes on. The brewers present a different opportunity to invest in alcohol. Most investors tend to buy into the wine and spirits categories with DEO being the most popular pick. I used to own BUD before it was bought out by InBev for its solid growing dividend. There’s no doubting the resilience of this sector which is why I think it deserves a look. Thank you for stopping by and commenting. I’m guessing you are referring to ABEV. No doubt, foreign withholding taxes can be a drag on investment returns especially when the take can be 25% or more. Still, with some higher yielding foreign entities, even with a withholding tax you can still generate a pretty nice passive income stream. Thank you for sharing your thoughts.